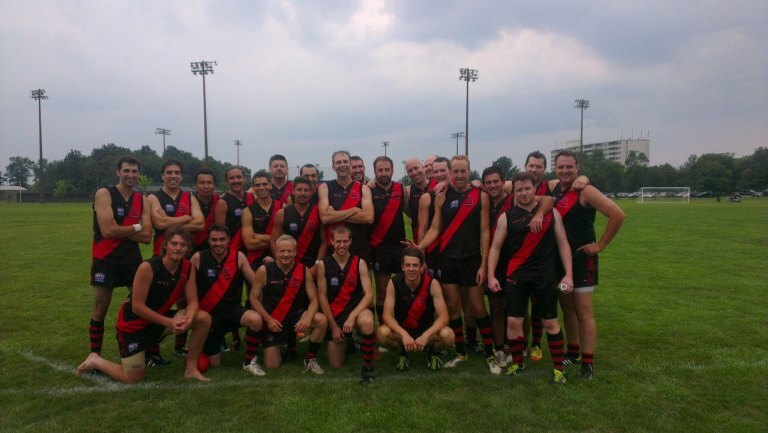 The Toronto Dingos made the drive to Steeltown this past weekend to take on the Hamilton Wildcats in what was the 'Cats 300th match in the OAFL / AFLO - an impressive accomplishment for a proud club. 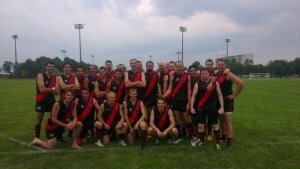 Despite some wet weather and an irregular lineup, the Dingos were able to shake off a slow start and crossed the 100+ point plateau for the first time this season, busting out in the 2nd and 3rd quarters and cruising to a 11-goal victory. Once again, the first quarter proved to be the toughest for the Red and Black, who fell flat after an early goal and allowed the 'Cats to dictate the pace of the game for most of the first quarter. With the 'Cats playing in familiar settings, the Dingos found themselves chasing contests and mis-judging the pill in the air a few too many times for comfort, and it wasn't until the last 5-10 minutes or so of the quarter when things finally started to click. Despite the early troubles, the Dingos did manage to throw up 4 goals on the scoreboard while holding the 'Cats to just 2, but the effort level simply wasn't where the coaches wanted it to be, and head coach Justin Robertson let the boys know it during the break. The results on the field were immediate, as the Red and Black went out and played shutdown footy and held the 'Cats completely scoreless through 20 minutes. On the offensive side, the footy began to flow more for the Dingos, channelling through mid-fielders Rainer Haycraft and Malcolm Brady while big Wade Edwards was taking grabs and converting goals. The mid-fielders also made a key adjustment in the centre-bounces, and suddenly things were clicking for ruckman D'Arcy Hill (playing in his final regular season match) and the team as a whole, and clearances came that much easier. When Wade was sent off for a spell for some poorly time wordplay, Matt Pollett stepped up and seemed to grab everything near him, elevating for marks and popping in two goals on the run. By the end of the half, the Dingos had built up a 5-goal lead and were playing with much more lift and consistency. That ease of play continued throughout the second half with more players stepping up, such as Tom Bell and Yoni Moussadji who provided linking options from backline to foward, and rookie sensation Camilo Serpa, whose ability to crum and kick under pressure was quickly becoming legendary. But for all the offensive success, the foundation was the backmen who had picked up the team early in the second quarter and played rock-solid footy all game long. Led by Paul Pickering (playing in his final game for the Dingos) and Bobby Clarke, the Dingo backline made Hamilton work for every look at goals, holding the home team to 1.1 through the 2nd and 3rd quarters and being an integral part of the offensive push. By the final siren, the Dingos had amassed a 16.11 scoreline, breaking that 100 point barrier for the first time in 2013 and showing the depth of the team overall (missing 8 regular starters). It was also a fitting send off for Pickers and D'Arcy, who have both been crucial parts of the Dingo engine this season and will leave behind major voids to fill.